Green valley, golden wheat, purple potato flowers, brown hill, red mountain, blue sky. You would never look at this and say “yes. This is a road.” And yet somehow, on we plow, on narrow dusty paths hugging mountains and cliffs, over rocky, hoof-trodden scrabble, through deep streams that soak us to our knees and send steam boiling off the engine. Sometimes I have to get off and walk, as the way is too precarious for two on the motorcycle. In some places the road simply disappears into ravines of dried mud as deep as I am tall. The occasional vehicle lumbers past- zippy Pamir motorcycles, the odd dusty Corolla with California or Maryland license plates, ancient Russian 10 wheeled Kamaz trucks, and 25 year old Town Aces, heavy laden with passengers and goats, roofs piled high with clothes and potatoes and plastic jugs. Lurching and teetering like a very slow roller coaster, I am simultaneously awash with fear and acceptance as we round impossible blind curves at 30 degree downhill angles over mountain streams that crisscross the road. Thankfully we see no carcasses of burned out vehicles on the slopes and valleys below us, so acceptance wins. Life pours out of the mountain streams- shocking valleys, crowded with lush, thick grass, slender trees, wheat and potatoes- snaking through towering mountains and soaring cliffs. Girls adorned in a rainbow of chadors wash dishes, and lay bright clothes out to dry on the stream banks and hay bales nearby. Delicate flowers with sharp leaves defy the altitude and mountain rock with life; purple and pink hug the ground, while yellow and white blossoms perfume the wind on slender stems, reaching even further into the sky. Something resembling Baby’s Breath tower to the size of small trees. Hills roll over the high plateau around 3,000 meters. Ruins dot the plains- crumbling mud houses resembling deserted Narnian castles. What ancient civilization used to be here? One that has not changed in a thousand years- sheep and goats rest in the shade of the ancient remnants, while villagers carry on life inside the earthen walls of handpacked mud houses just beside. Tattered flags whip and wave atop the roadside rock pile graves of mountaintop martyrs. Herds of sheep and goats cause intermittent traffic jams at 3400 meters, while the winds blow ancient dust across the Hindu Kush. The road condition is something like driving on crushed up chalk. 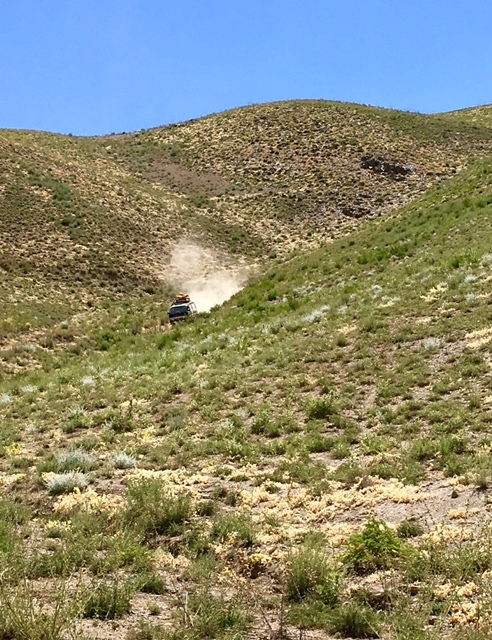 Dust splashes like water when the front wheel hits deep ruts. The way, already challenging, becomes treacherous and the beautiful scenery gives way to full focus on keeping the bike upright. Intense praying. The wheels spin out and we go sideways– I can hear Alex saying “no no no no no,” and then “honey are you ok? Are you ok, talk to me!” The bike is on top of me, but our limbs are intact and our heads are still attached. I have broken my feet enough times to know something was wrong with my right ankle, but I cannot yet quite determine just what. All I know is that I do not want to let go of it, and visions of Kabul airport in a wheelchair and cast for a third time flash before my eyes. Although we are both banged up, the chalky dust road ends up being our salvation. Had we been on the hard scrabble, our cuts and bruises surely would have been broken bones and road rash. God is good! Inshallah we crash only about 100 meters after a small enclave. The men and several children amble out to stare and assist- a young child comes and brushes the dust from my back with a bundle of fragrant leaves, and one of the men helps carry me to a solid embankment while Alex tends to my rapidly swelling foot and bleeding ankle. His own trousers are torn and bloodied- he has ripped a dime sized hole in his right knee, gashed his waist, and a huge blue bruise is forming on his thigh. The villagers assume we are doctors- why else would we be traveling in such a remote area with such an extensive first aid kit? The village men pour water on our wounds and retrieve mirrors and broken indicators that are scattered on the road. They insist we come with them to the village for chai, but shamefully, we are too shaken and in need of our final destination to accept. A mere 10 kilometers can equal several hours on this road. I will never stop regretting that we declined this invitation. Gingerly, we limp back to the bike, and continue on. We still have at least another 1.5-2 hours til Bandar, where we are supposed to spend the night, and we can’t afford to linger any more. To our chagrin, the road does not improve- miles of shifty sand, barely lodged on the side of steep cliffs, sharp dips and steep inclines keep our hearts in our throats and legs firmly clamped against the bike. The road rises and falls endlessly before us, an infinite ribbon winding through the endless mountains, until Alex says the fateful words “I don’t think we are in the right place.” As it turns out, his colleague had input the wrong coordinates into the GPS device, and we are headed for Sangitakht, the centre of a district of the same name in Daykundi, instead Bandar, in the west. In between us is an expanse of 50 km of rough road- at least another three hour drive. Fortunately, Alex remembers from a previous trip to the field that there should be a small inn in the Sangitakht main bazaar. Alex’s constant level-headedness and prepared-for-anything attitude, combined with my love of the unexpected and easily delighted spirit transform what could have been a grave disaster- being lost, injured, and alone in provincial Afghanistan- into a delightful experience of God’s grace and Afghan hospitality. We pull in, exhausted, and are warmly welcomed as old friends by the proprietor, a smiling gentleman named Khalid. Our room is spare, but clean enough, and the toilets… exist. Khalid prepares the most delicious meal of naan and shorba, and a plate of fresh spring onions. Khaarajia are a rarity in Sangitakht, and we are visited by the local police to make sure we are ok, and that we have enough chai to warm the spirits of a whole village. After a responsible adult discussion, we decide that, given the fact that Alex’s braking leg is a bit messed up, and I can’t walk, the responsible course of action would be to hire a van back to Yawkalang, where the road to Bamyan is paved. The next day, in an ancient Toyota Town Ace van, we realize just how ridiculous the roads were. Clouds of dust keep our windows closed and scarves wrapped around our faces. The motorcycle, strapped into the back and wedged with bald tires, looms menacingly over my head as we lurch over the mountains at miraculous angles. We are tottering along a high ledge, with barely enough room for two people to walk abreast- our driver is a magician for keeping the van on this “road!” A lone woman appears out of nowhere, staggering along the ledge; she heaves herself against the side of our van, crying for a ride. The driver waves her away, but how can we let her continue by herself? A few meters later we pull her into the dusty van and continue on. She has walked all the way from Ashtarlai, a remote district at least 60 kilometers away. She is on her way to Bamyan, another 100 kilometers! I don’t think the driver is super happy about this, but what else can we do but take her? It’s Eid, after all. Khushit is curious about the motorcycle, and very confused about me, a strangely dressed Hazara girl traveling with a foreign man in a bandana and Indiana Jones hat. I try speaking with her, but her Dari is garbled. Driver says she is speaking partly Urdu. She says she has a son in Bamyan, and either she or he is sick. I can’t quite understand. When we stop in Yakawlang and unload the bike, she disappears into thin air. Hazara schoolkids. I mean look at that middle one, he could be my son! I lived in America for 26 years. I never looked like anyone there, other than my sisters. I lived in Hong Kong for 8 years. I never looked like anyone there either, except when my sisters came to visit me. I have been living in Afghanistan for 2 years (math! I’m about to turn Very Old! ), and here I finally look like a local, and can melt deliciously into the crowd. The Hazara ethnic group is widely assumed to be descended from Mongols, who invaded Central Asia during the time of Genghis Khan. Years of intermingling with Turkic and Aryan ethnicities in this region have resulted in a distinct mostly-Asian look, which is unique from the other ethnic groups in Afghanistan. The Hazara are the third largest ethnic group in Afghanistan, and the first largest in my neighborhood. As such, I conveniently blend in with my Japanese-Swedish-ness, and I have not met a single person here who did not automatically assume I was Afghan. Most people speak to me in Dari, and I get stopped at the airport with my two allowed khoregi (foreigner) bottles of alcohol every single time. It is so wonderful to look like my neighbors and adopted countrymen—I feel like I actually BELONG here. When you fly from Kabul to Bamyan, the airplane must make a sharp left turn to get out of the bowl and over the mountains that ring the city. This is followed by an endless continuation of mountains, as far as your eye can see. You will be subsequently treated with a peak-skimming voyage, and realize just why Afghanistan is so special, and so unique in every way. There is, simply, nothing but mountains. Every once in a while, you may spot a surprising cluster of houses; this absolutely boggles the mind- how on earth did they get there? There are no trains, no airports, no roads, there are just mountains. From the moment you step off the plane into what is little more than a tidy parking lot, you are transported to a different world. From the tarmac itself, you can already see flat topped mountains, snow capped peaks, and the freshness and stillness of the air fills you with life. The valley here is old, historical, spiritual. The niches which the Buddhas used to occupy are stark reminders of what once was; however, this absence is not the most spectacular thing about the famous valley. The niches are set into high golden cliffs riddled with hundreds of caves in which monks used to pray and meditate. A scramble through these caves reveal ancient paintings in red and blue and green hues- images of Buddhas and lotuses cover ceilings and cracked facades. Peering out the caves onto the valley below reveals the crumbled old bazaar, a shock of vegetation unfamiliar to Kabul city folk- wheat and potato fields ringed with irrigation canals, and, in the distance, layer upon layer of ever growing mountains. When you think your eye is focusing on the tallest ridge, you notice the backdrop is not cloud, but more mountain. And behind that, still more and more mountains. Gazing out over this surreal landscape, you get a sense as to why the ancient Buddhists chose Bamyan as their home. There is mystery and wonder in the air. The morning mist rises through the swaying trees and dissolves into the air like the prayers of the monks; memories of the giant stupas and domes of Borobudur, and the thousands of temples materializing through the misty Bagan sunrise tug at your heart as your breath catches in your throat. It is not often in life that you get to see the most beautiful thing in the world, but in Bamyan it is a daily experience. stunning Bamyan valley, mountains, more mountains, and more mountains! Due to the crippling incompetence of the now bankrupt and grounded Eastern Horizon airlines, my first stay in Bamyan was extended multiple times. I could not be more grateful. My friends and I took advantage of our additional holidays by walking every inch of land we could manage: Band-e Amir, Shahr-e Zohak, Gholghola, Foladi Valley, and a strenuous, but rewarding 16km up and down mountains trek to the Dragon Valley. My second trip, with the infinitely more dependable UNHAS flight was even more adventurous, featuring midnight motorcycle rides through inky black valleys, a Buzkashi, and sinking into 3 feet of snow while hiking up mountains for the ultimate off-piste skiing experience! My surname is Moberg, which is the Swedish word for mountain. My mother’s maiden name is Yama, the Japanese word for mountain. My Chinese surname is Shan, which means mountain. 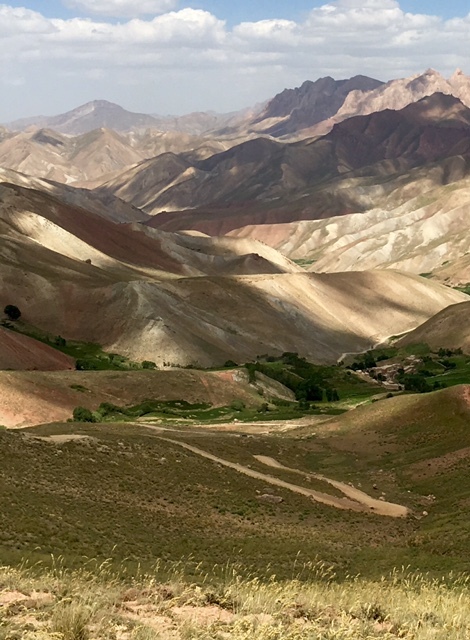 Bamyan, Afghanistan, these mountains surrounding me, towering over me… this is where I feel most comfortable, the most “me.” Trekking through these mountains is both exhilarating and grounding, surrounded by the sheer enormity of nature. You stand a thousand feet in the air, with the sensation of being on top of the world, only to realize the rock on which you are perched is a foothill compared to the surrounding peaks. You feel wholly alone, and yet completely at one with the universe at the same time. You are a tiny speck. You are, as Rumi so eloquently said, “the universe in ecstatic motion.” This place is too special not to visit– the beauty will change you. Shahr-e Zohak (Red City): served as a fortress and customs station along the silk road centuries ago. Shahr-e Gholghola, the city of screams. This, and all of its inhabitants, was destroyed by Genghis Khan after the death of his son. Buzkashi is Afghanistan’s most famous sport. Played in the winter months, buzkashi consists of two teams of horsemen, vying for the carcass of a recently deceased goat. If you have seen Rambo 3, you know that it is a crazy, violent sport, which sometimes involves the horsemen charging into the crowd of spectators. 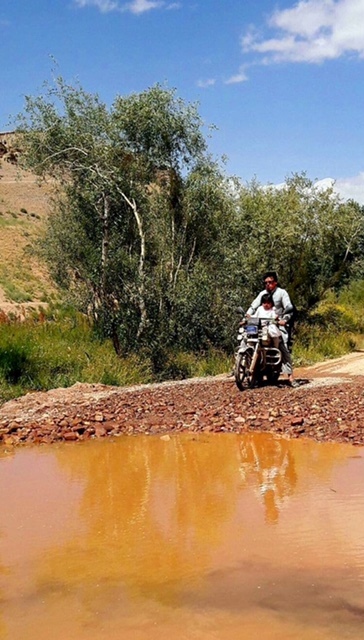 This is a must-see in Afghanistan– wild, beautiful, full of life. Snowboarding in Afghanistan, say what?? As this is the country of mountains, it seems logical. However, this is also the least developed country in the world (fact), so ski lifts and groomed runs are not exactly a high priority for infrastructure and development. That said, there are no fewer than six winter sport organizations in Bamyan, and we had the good fortune of hooking up with the Bamyan Ski Club for a day of strenuous hiking, peppered with a few runs. Though insanely difficult (imagine a not-quite-five-feet individual, yours truly, hiking through 3 feet of powder up a huge mountain with a snowboard on the back. besyaaar sakht!! ), the views were spectacular, and the experience just out of this world. The conditions were *challenging*- the slope is not groomed, so in some places it is 3 feet of powder on an ice pack, in others, chunks of rock, in others, bushes and trees growing through the snow. Despite this, seeing local girls, village kids, and your odd foreigner trudging up and sailing down this barely touched mountain was absolutely fantastic. Only in Bamyan could this be so! we climbed this. but only once, holy moly. me and A on the cliff we almost skied off. thanks, random guys, for waving us away from certain death. Whenever I am feeling beset with doubts or discouragement, whenever I am feeling that Afghanistan is lost, that this place is beyond redemption, I remember the beauty and serenity of Bamyan. I remember that, in the midst of uncertainy, chaos, destruction, violence, corruption, and inefficiency exists this perfect place- a place of harsh beauty, of intense spirituality that permeates every sense and arrests the soul. Bamyan is the Afghanistan that once was, and that still can be. plaidpiperblog on Bamyan, my Jan! Hussain Ali Karimi on Bamyan, my Jan! Karis on Bamyan, my Jan!